Earlier today, the US Supreme Court issued a much-anticipated ruling in the case of ABC v. Aereo. Aereo is the company that had offered subscribers the chance, essentially, to “lease” a small antenna to receive broadcast TV signals and view the programming via the internet. Broadcasters sued, seeking an injunction, claiming copyright infringement. The injunction was denied at the District Court level, and the 2nd Circuit Court of Appeals affirmed that ruling, so the Broadcasters took their appeal to the highest court of the land. Today, that court reversed the lower courts, agreeing with the plaintiffs that Aereo's service amounted to an unlicensed “transmission” and “public performance” of copyrighted material. 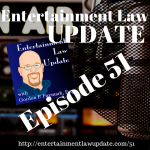 My podcasting co-host, Tamera Bennett and I discussed the case in a short special episode of Entertainment Law Update Podcast. Please give it a listen!